The cultural histories of the Uchee and Apalache Peoples in the Southeast, the Panoan peoples in Peru, the Maori People in New Zealand, some of the royal families of Hawaii and several tribes on the Northwest Pacific coast of Canada and the United States suggest complex origins from several regions of the world. There are many unsolved mysteries. Dr. Ray Burden, recently retired from the University of Tennessee, and his daughter Lani Burden, are setting up a Facebook site, where contributors can provide information on their DNA profiles and family histories which will hopefully provide more scientific information on questions that heretofore have been largely ignored by academia. Burden is of mixed Uchee, Creek and Northwest European descent from Northeast Georgia. He recently was astonished when a scientific genetic study of his DNA revealed Sami, Basque and Panoan DNA testmarkers. Uchee descendants in Georgia and South Carolina are showing up with Sami (Lapp) and Basque DNA test markers. The most sacred symbol of the Uchee and Creeks (Sacred Fire) was also the most sacred symbol of Bronze Age peoples of northern Europe. Highland Apalache descendants from North Georgia are showing up with Panoan DNA test markers. The Muskogee Creek and Savannah River Uchee word for water is the same as was used by the aboriginal (Pre-Gaelic) peoples of Ireland, Scotland and the Atlantic Coast of France. The exact same glyph for Great Sun or High King was used by the Bronze Age peoples of Southern Sweden, the ancestors of the Creek Indians in the Southeastern United States and by the Mayas. The Muskogee Creek word for people or clan, ke, is also used by some Southern Arawak tribes in South America and by several branches of the Polynesians. The Moari, Panoans of South America, the Itza Mayas and the Itsate (Hitchiti) Creeks of the Southeast all use the same suffix for “place of” . . . pa. The Cherokees use their version of “ke” . . . gi . . . for “people or tribe.” However, the Cherokee Bird Clan (Ani-Chisqua) is obviously descended from the Chiska peoples of Northeast Tennessee, who were obviously a colony of the Chiska people of Peru. Chiska means “bird” in Panoan. This is a complex puzzle that will probably take years of research to fully explain. When the new web site is up and going, People of One Fire readers will be notified. How can a Native American tribe be everywhere and nowhere? You’re welcome! As soon as Lani and Ray say it is ready, I will spread the word. Are you aware that the Hitchiti (Itsate Creeks) originally settled in the North Georgia Mountains, then spread northward and southward? or his parents. The first record I have of him was where he joined the US Army at Arsenal, Georgia in 1827 but had been living in Edgefield, SC. that the soldiers were the ones who built the new one which now stands on the University campus and is still used today as part of the campus. I know the Uchee tribes were also in the Edgefield area earlier or maybe around 1800 before they were pushed out into Georgia. I have learned so much about the history of Georgia and the Uchee people just from reading your Blogs and the more I read, the more I want to read. Your blogs have helped me so very much in my research and I am very grateful to you for being the Historian which guides my research when I get stumped. Richard, can you tell me exactly where Hitchiti was in Georgia? I have traced it in Alabama, but I did not know it originated in Georgia.Many thanks and Mvto. The area around Edgefield and Hardeeville, SC still today has many Creek descendants. Creeks also lived in much of South Carolina. I think that many of the Creeks around Hardeeville and Edgefield may have moved from the Creek town that originally adjoined Savannah. Hitchiti is an English word. The Creek name is Itsate, which itself is the Itza Maya’s name for themselves. Itsate or Hitchiti was the predominant language spoken by Georgia Creeks so they were at one time living in many parts of that state. They also lived in Western North Carolina and in parts of SE Tennessee. Consider also Seen Life, an pro-free-speech alternative to FB. Yes Richard I believe you are correct about the Bird Clan coming from Chiska. From what I have read and studied trying to find all I can on my ancestors that were in “Northeast Tennessee ” and on Yadkin River in North Carolina during the pre-Revoluntary time frame there were several different Peoples living here and surrounding area. Ancient man lived here we know from several sites that are close by and have bee “studied” (but not really as we know). In articles I have read from old works from 1800s and early 1900s it is said there was supposed to have been Chiska village somewhere between Erwin and Johnson City, Tn. and along with that I came across very early map of the area that has a section of Cherokee Mountain labeled as the Warriors Cove (since the Chiska where fierce warriors this might be referring to them). This is not far from Nolachucky River which has had settlements along it since ancient times plus add in that it is close to iron mines, hematite, then that makes me think Red Paint Clan. The land over the Blue Ridge holds discoveries even today just as it did so long ago. Scouting for ancestors can led you down many paths that you may never realize and to truths in history you where Not taught. Thanks so much for all the information you keep placing out there for the People to see and learn from. Much more archaeological work is needed in NE Tennessee and southern West Virginia in order to understand the origins of the Cherokees. After all, the first map to mention the Charakeys places them in that region . . . in large numbers. Perhaps archaeologists will also discover the villages of the Sephardic Jews, who lived in NE Tennessee. Col. John Tipton and Col. John Sevier described passing through “ancient” villages in that region, occupied by Jewish people, who spoke Spanish. Ancestry.com is having a sale right now, $79 for DNA testing. I was just about to order the National Geographic genome DNA kit for my sons and I. Can you recommend a DNA testing site that is best for testing for Native American heritage? Richard T, While searching for petroglyphs ‘ve found something interesting you might like to take a look at. There are concentric circles found off the coast off Brazil on Coral Island which is directly next to Santa Catarina Island. Is this one of the locations where Sami / Saami and ancient Irish related people have visited and perhaps settled? Could this be “Brasil” or “Hy-Brasil” a mythical island from Irish legends? At the Beach Resort of Costao do Santinho, on The Island of Santa Catarina on the coast of Brazil there is yet another interesting finding. 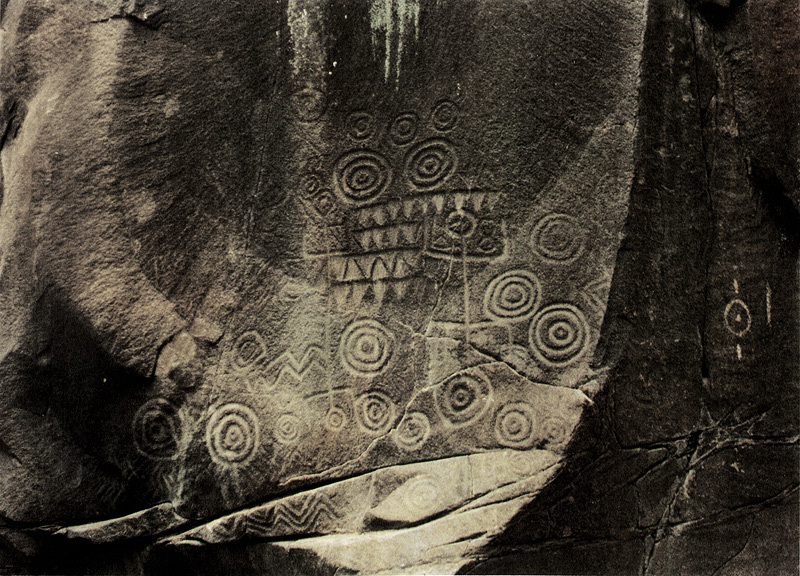 Yet again, seemingly the Sami / Saami; if the petroglyphs are of Sami origin; are somehow connected with Polynesians and possibly other Non-Polynesian Oceanians / Pacific islanders. A Bulgarian scientist did linguistic research on the Xokleng and Kaingang languages of the Macro-Ge language family in southern Brazil where he found similarities with Austronesian (Polynesian) languages. Notice that the Shokleng (Xokleng) and Kaingang languages are in the direct area of Island Santa Catarina. The Maxakali language is in and around the location where the controversial Botocudo skulls with Polynesian DNA were found. Some believe that the Botocudo skulls with Polynesian DNA were mislabelled from a skull collection from a museum. In New Zealand (Aotearoa) North Island; you can find a Canoe petroglyph with swirls inside the canoe in Kaingaroa southeast from Rotorua and northwest of Taupo. Yet some swirls look like centric circles. YES! As I said in the recent Humor article, I have come to believe that these Bronze Age mariners ventured all over the Earth. It sure looks that way. Richard, It looks that way indeed. Now another question or atleast one of many more questions to come; was there only one people; in this case meaning people from one particular land or continent; who ventured all over the Earth or was there a concept of all people being connected and related with each other, living in harmony, contributing and passing on knowledge and developing technology for all until at one point in time everything fell apart and each went there own way? All people on the Earth on each continent seem to have shared and in some cases still share a common language. PS: About the Canoe petroglyph in New Zealand / Aotearoa; The petroglyph can be found in Kaingaroa souteast from Rotorua and northeast (NOT northwest) of Taupo on the map / link that ‘ve provided in the earlier comment. I was at a family reunion in SE Georgia this weekend and my cousin from California made an interesting comment about a part of our family. The Poole family lived in the Wrightsville area and were known to intermarry with in the family. One of the girls created a scandal when she “took up” ( started courting) with one of the Ivey boys from Soperton about 20 miles away. My GGG grand dads and uncles were known to go to the next county or so to find a wife because it was tradition. In past articles you said the Creek were known to do this same thing, go to another clan for a spouse, but did any of the Uchee or other tribes in the SE have this tradition? Most European descendants appear to not have this practice, they married close cousins and such. Thanks and I cant wait for the next series of articles! Absolutely, Wayne . . . by the 1800s, the Uchees were Creeks. They had forgotten their old language and customs. Wrightsville and Soperton are prime Uchee areas . . . the Ogeechee Uchees. Wrightsville is one of the areas, where my Native American ancestors went to find spouses. Thanks for confirming that info. I hope to find more about that part of my family. I have been fighting the “Cherokee Princess”myth so common in SE family history. I firmly believe that if we have native American DNA it will show the Uchee markers, not Cherokee.